Speaking on Friday, CEO of the Odyssey Trust, Robert Fitzpatrick voiced his commitment to bring an NHL team back to Belfast in 2020. Marking 20 years of the Belfast Giants and the 10th anniversary of the Boston Bruins making their Belfast debut in October 2010. Talking with A View from the Bridge’s Joel Neill during the semi-finals of the NCAA Friendship Four, Robert took the time to commend his team in organising another successful tournament. He also furthered the assurance of the tournament’s place in Belfast stating that 3 of the 4 teams have already signed up for the 2020 edition. The NCAA will return much sooner with the Women’s games between Northeastern and Clarkson on the 5th and 6th January prior to the Giants own home games against the Sheffield Steelers. But when pressed on what could be next he gave his own commitment to bring back an NHL team to the SSE Arena in 2020. More importantly, however, he reaffirmed the Odyssey Trust’s desire to have a new ice facility built in the city of Belfast, something that is desperately required should the Belfast Giants want to take local development to the next level and allow more home-grown players to wear the Giants crest in the EIHL. “We need to build on the brand that we have now, to get permanent ice facilities in Belfast, that’s what it’s about”. When asked how important it was, his belief was clear. It was an issue that was spoken about by Robert at A View from the Bridge LIVE a couple of weeks ago in McCools bar, and further picked up by Simon Kitchen on the subsequent AVFTB podcast. Simon, a former Irish Ice Hockey International, highlighted just how critical it was for another ice pad in Belfast, should the game want to sustain and develop in the city. Dundonald Ice Bowl opened its doors in 1986 and for the last 32 years has been the primary facitlity on the whole island. Yet the profile of the sport of ice hockey has been taken to the next level with the successes of the Belfast Giants and the staging of a number of major events, not least last weekend’s NCAA Friendship Four, the previous weekend’s IIHF Continental Cup, the IIHF World Championships in 2017, and the aforementioned visit of the NHL’s Boston Bruins in 2010. The time is here to strike while the iron is hot. To use this profile, the links and friendships within Belfast City Council and, most notably, the support and voice of the fans that wear their red, white and teal with the upmost pride right across the City and beyond. Aiding the development of the game, the team and the club by chasing down a brand new ice rink in the City of Belfast. 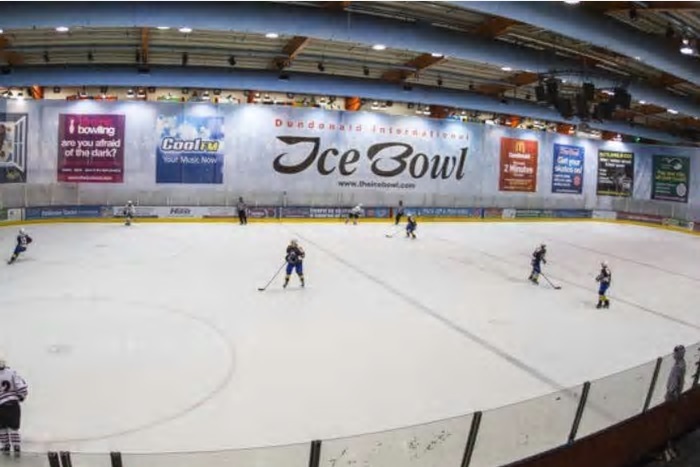 With the potential of another visit by the NHL, the annual residency of the NCAA and the successes on the ice of the Belfast Giants, a new facility would cement ice hockey’s place on the sporting landscape of Northern Ireland. And further establish Belfast’s reputation, worldwide, as a hockey hot-bed in Western Europe. PODCAST: We’re On Our Way! – This Week’s A View From The Bridge chats to Aaron Murphy, lead TV commentator on this weeks tournament, about the NCAA Friendship Four, as well as interviews with Josh Roach, Adam Keefe, Jonathan Ferland and Blaze Head Coach, Danny Stewart.